You’ve bought a beautiful new house, you’ve moved in all your furniture and now you’re wondering how you can afford to decorate. Perhaps the decorations you had in your old home don’t align with the new vision you have. Or, maybe you don’t have nearly enough decorations to fill the empty spaces. No matter what the problem is, one thing is clear: decorating can be expensive. When it comes to your new home, you shouldn’t feel limited because of the cost. In fact, with a new home, you should be able to create a space that is truly yours. After all, you’ll be living in it for a while! 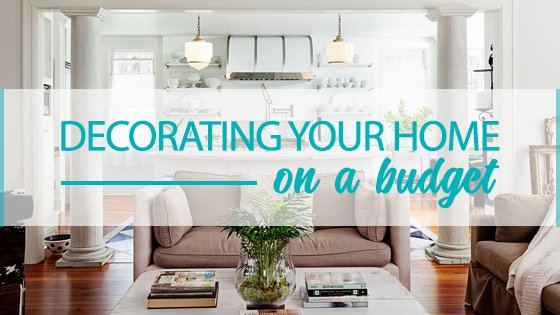 Luckily, there are several easy ways to decorate your home on a budget. Decorating with paint is often overlooked. Paint is one of the most cost-effective solutions for decorating your house. While it takes time to change the colour on the walls, once it’s finished, you can finally feel like the space is yours. If you don’t have the time (or money!) to paint multiple rooms, consider painting a single wall. This can give a room the pop of colour it needs. If you love the colour of your walls and don’t want to change them, try painting furniture you already own. Perhaps those white chairs sitting around your dining room table will look better as a rich brown? If so, then paint is the way to go. Don’t underestimate how nice last year’s calendar can look when framed. While many simply recycle their old calendars, they actually make incredible art pieces. Of course, this depends on whether you still buy calendars to track your schedule. However, if you’re not the type to purchase a calendar for writing down key events, purchase one as decoration. Guests to your new home will enjoy flipping through the months to look at the beautiful photos displayed in it. Then, once the year has come to an end, you can take the prettiest pages and hang them on the wall! If you want to change the design of your coffee table or desk without buying a new one, try using contact paper. Contact paper is fairly inexpensive and has a decorative surface on one side, and an adhesive material on the other. It’s incredibly easy to use and you’re able to place it on various pieces of furniture such as drawers, shelves and even laptops. Since it’s normally sold in bulk, you’re able to cut up the contact paper and fit it to whatever surface you’re placing it on. The decorations you already own were bought for a reason. Sometimes, especially if you’re on a budget, it’s easier to shop in your own home. Relocating decorations from the bedroom to the living room can change the style of both rooms and allow guests to see decorations they’ve never seen before! Get creative with what you already own. Use empty vases as decoration by placing artificial flowers into them. The cute mugs you have hidden away? Display them on a nail board for all to see. Once you take a look at what you already have, you’re sure to find your most sentimental decorations. Have you decorated on a budget? If so, what was your favourite decorative piece?